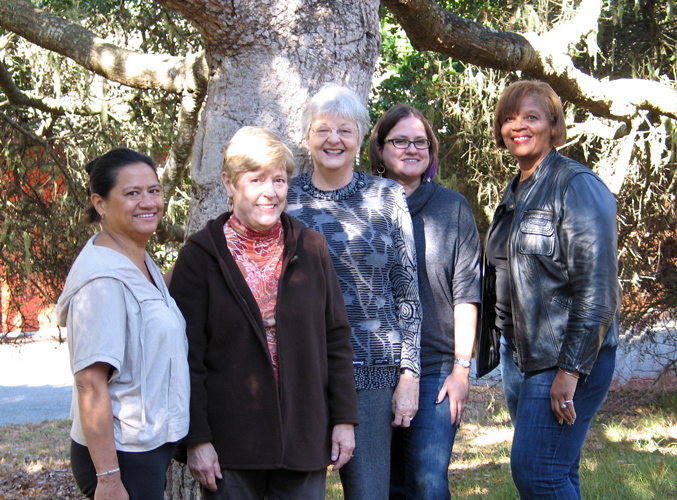 These women enjoyed 3 nights of the Sewing Retreat and vacation with Jane. They all had fun sewing, shopping, walking the beach, running, and just having a good time with each other. 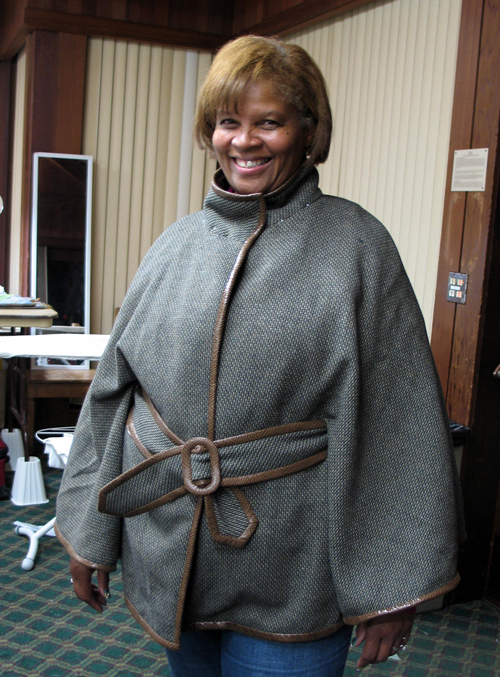 Susie used the London Cape pattern designed by Jane for her new wool cape. The buckle was covered by Pat Mahoney in Lodi, CA. See Jane if you need her contact info. 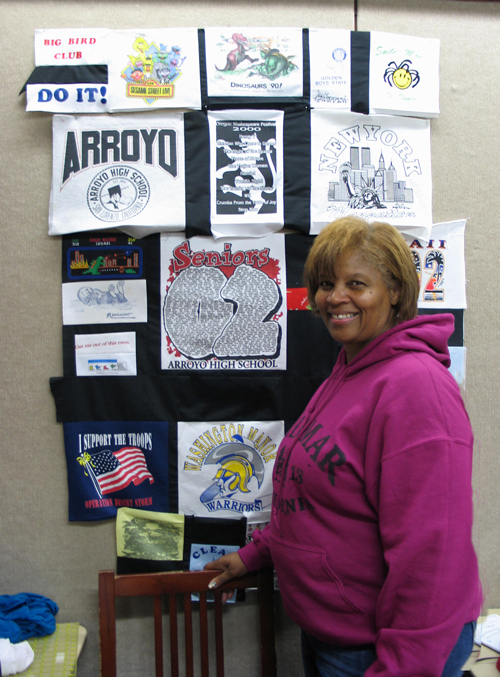 Susie was commissioned to make a quilt using tee shirts from the son of a client. 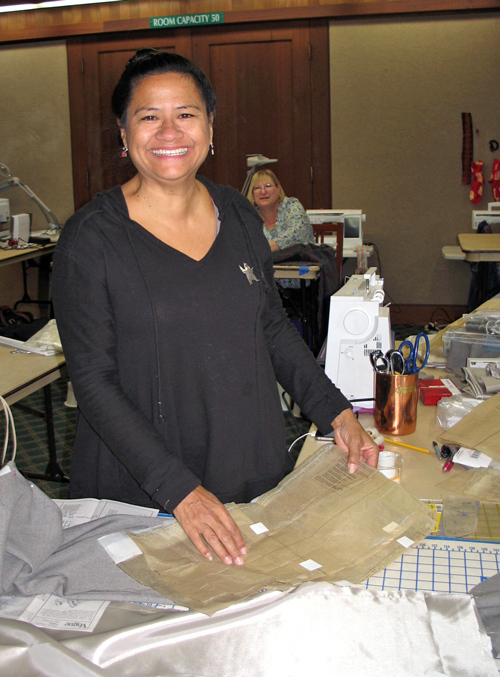 Ruth is working on her second couture jacket. She always finds the colors that perfectly suit her, and has a great smile. 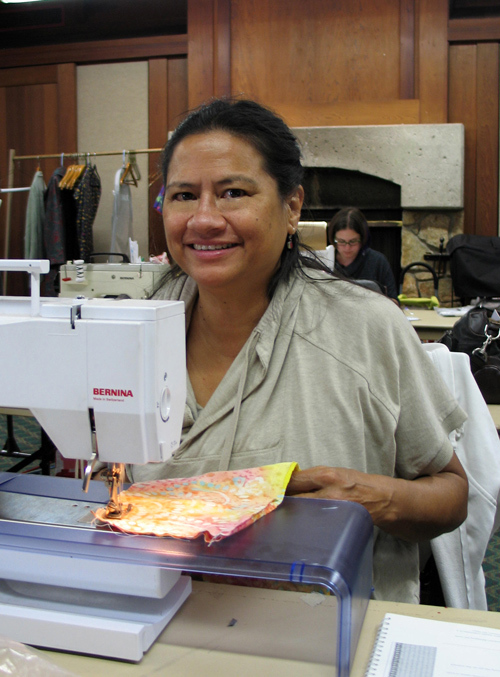 Winny's mother began teaching her to sew when she was just 5 years old. How wonderful is that! 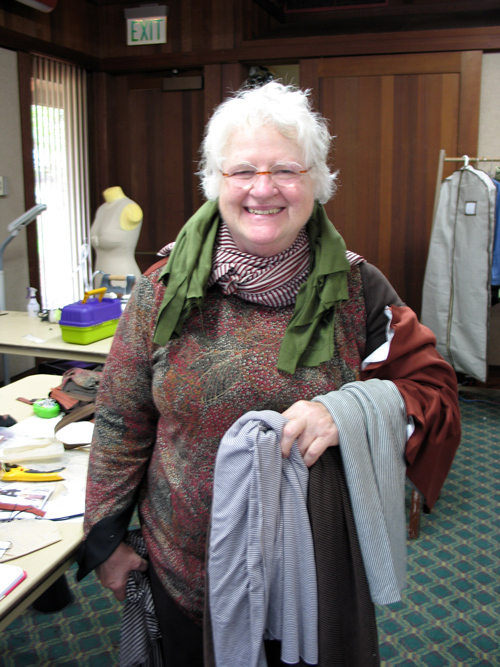 She made an incredible pair of wool slacks that had a front zipper and a back yoke. Jane fit them beautifully to her. She makes a few outstanding garments a year, and comes to Jane during those times. Winny also made a knit top with a batik look. 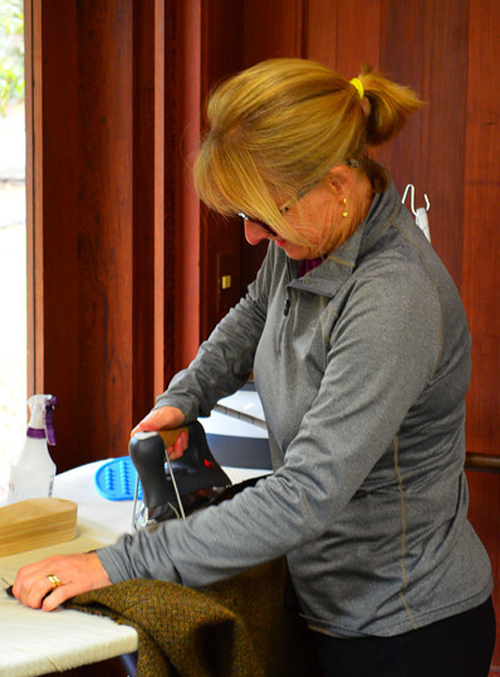 Its fun to watch an accomplished seamstress work. Carrie is having Jane tissue fit a new jumper after breakfast. By evening she is ready for Jane to mark the hem. In between this she also had time to get a pedicure! Carrie is amazing. 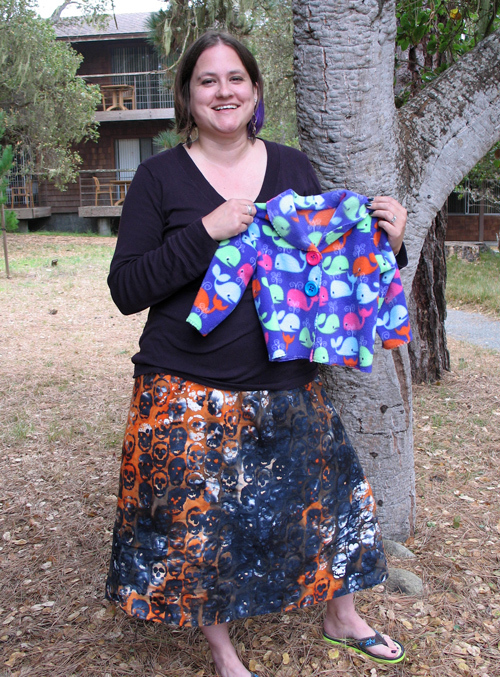 She always finishes a lot of projects, and has started her own business selling kids & women's clothing. Carries finished a pair of slippers, a dog coat, a doll coat, and several kids items. Her new skirt she just made will be very wearable for her, and the kids jacket is adorable. 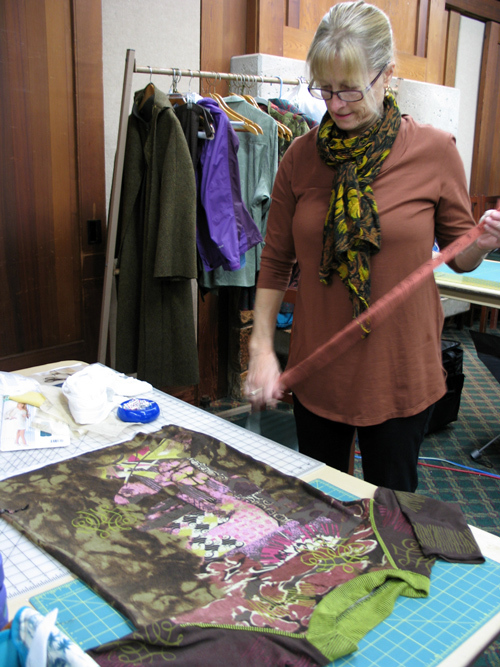 Maria is making a tee shirt with a panel of fabric from EmmaOneSock. She didn't have enough fabric for the sleeves, so she added a brown from her stash and stenciled a pattern on the sleeves to coordinate with the body of the shirt. 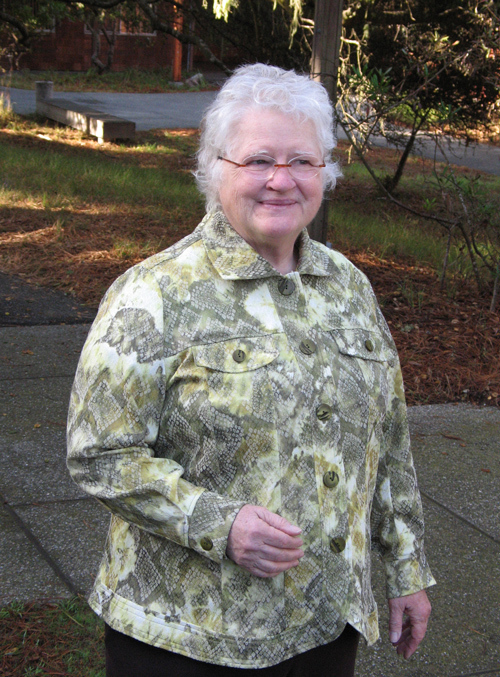 She used a green knit for the neckline and piping. Maria is really going to have a great coordinating wardrobe with all these fabrics. She purchased them for Jane's readywear Chanel challenge, and all the separates are designed to coordinate with each other. 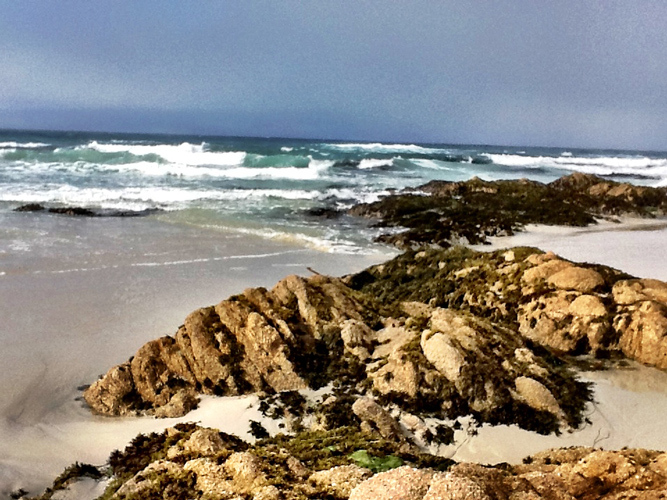 On a shopping trip to Pacific Grove she found a silk scarf to compliment these outfits. 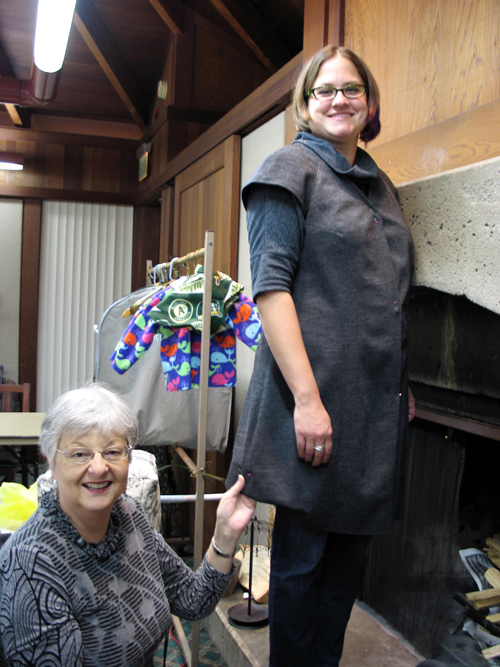 The coat Maria is pressing is well on the way to being finished. The high collar and pocket trim is a coordinating fabric to the main fabric, and once they were sewn on, you just loved her coat. The folds on the coat back are outstanding. 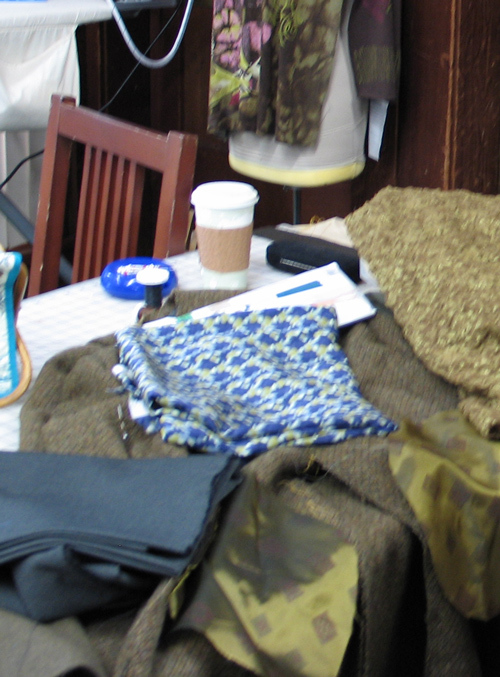 We don't have a photo yet, so check back on the "Challenge" page in a few months to see all her finished garments. Sharon is laughing and having fun auditioning different fabrics to be used in her tee shirt. 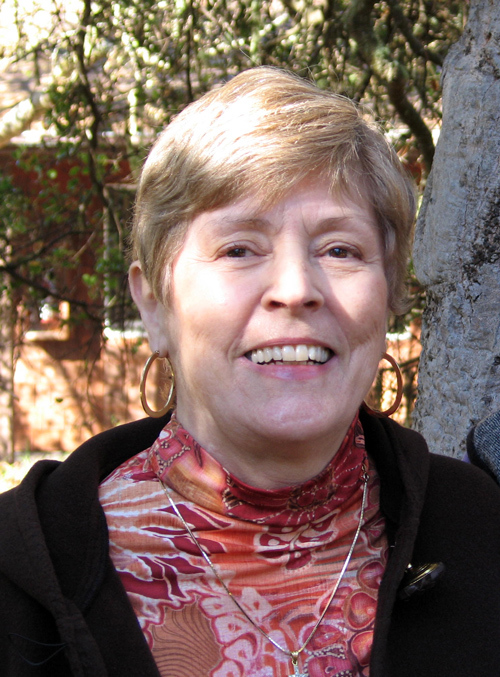 The pattern for Sharon's jean jacket was traced from a Coldwater Creek jean jacket. 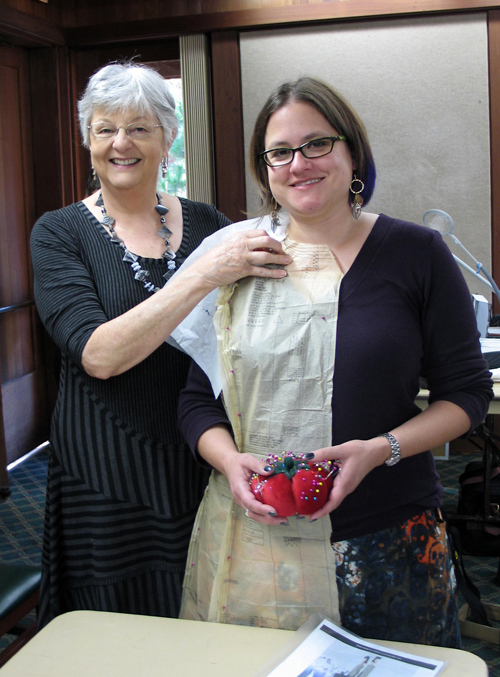 She purchased the bottons from Britex, and the fabric from Ginny's Fine Fabrics in Rochester, MN. Jane drafted the bottom of the sleeve pattern so the cuffs would hang properly when the elbow was bent. 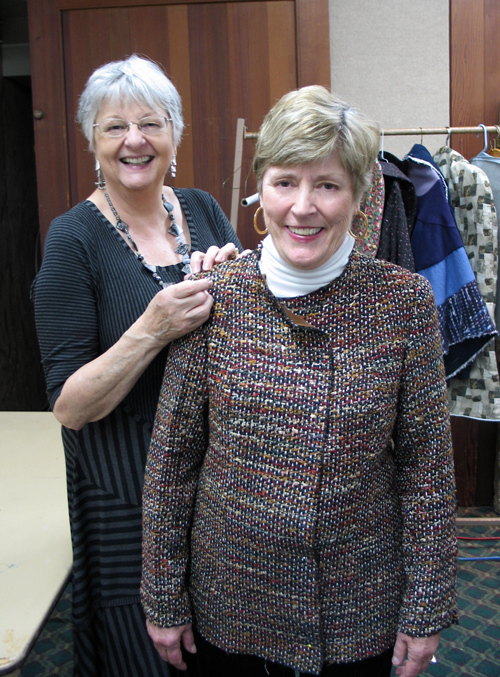 Sharon loves this jacket and has had many compliments on the jacket and the fit. 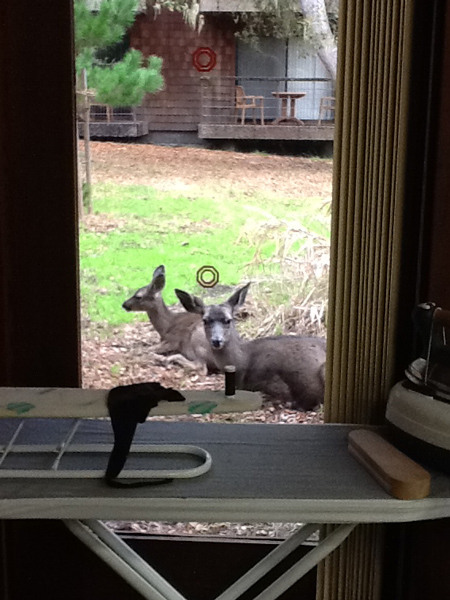 These deer were often resting outside the window of our sewing room. There were about 7 or 8 deer in a group sleeping here during the day.